Since When Do We Pay People to Eat? It seems that competitive speed eaters, like recent "Wing Bowl" winner Molly Schuyler, who plowed though a mind-bending 429 chicken parts over just 30 minutes, must maintain a steely, singular focus to give themselves the best shot at claiming the trophy and winner's check. 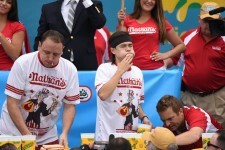 But considering some body-prep techniques often used to help clear the path (or more correctly, the throat) to victory, it seems that these champions of chow may be losing sight of the health dangers inherent to the sport. The secret to success for many speed eaters is drinking water. Guzzling huge amounts in order to win. But that dangerous practice can lead to a potentially lethal condition known as "water intoxication." What's more, there's a range of other health problems that can come from competitive eating. With water being the secret sauce of the sport, let's take the case of Joey Chestnut, an eight-time Nathan's Famous hotdog eating champion. In an interview with WebMD, Chestnut said he would gulp down gallons of water before, during and after contests. Claiming it helped the dog deluge settle in his stomach, he'd even dunk the buns in water. Water intoxication, or poisoning, occurs when too much water is consumed in a very short period, which prompts sodium levels in blood to drop precipitously. This can lead to brain swelling, stroke, coma and sometimes even death. Some competitive eaters like Dave Brunelli, who experienced dizziness during training, learned to cut down on his water intake to solve the problem. But others were not so aware, or lucky. In 2007, Jennifer Strange drank two gallons of water in a contest, where the top prize was a Nintendo Wii. But after finishing in second place, she died of acute water poisoning. Strange was 28. Speed eating has been the focus of some medical research, with the most-frequently cited findings coming from the 2007 study "Competitive Speed Eating: Truth and Consequences." While the stomach of a healthy person sends a signal to the brain when it's full, researchers say that speed eaters train themselves to short-circuit this connection. Researchers found that competitive eaters train their stomachs to act as flaccid sacs, where they can store food without satiating their hunger. Take it from last year's Wing Bowl champ Patrick Bertoletti. "I don t have that switch that tells me I ve had enough," Bertoletti said. "Too much of anything for anyone is not nearly enough for me. I don t have that switch. It s bad hardwiring really." Researchers said gastroparesis, or "delayed gastric emptying" occurs, as the lack of a fullness signal to the brain prevents the stomach from emptying itself of food. As a result, this condition can do bodily harm and could potentially lead to the surgical removal of stomach parts. Other health risks from competitive eating, which are unsurprising, include chronic nausea and vomiting. The study also stated that as young speed eaters grow older, they could lose their motivation to diet and exercise. But their insatiable hunger would remain, leading to obesity. Researchers wrote that "despite its growing popularity, competitive speed eating is a potentially self-destructive form of behavior." These health risks led the International Federation of Competitive Eating to take action and work to improve participant safety through medical supervision and regulation during contests.